Fiberart International 2019 (FI2019) is the 23rd in a series of triennial juried exhibitions sponsored by the Fiberarts Guild of Pittsburgh. Featuring 57 artworks by established and emerging fiber artists from eight countries and 43 states in the U.S., the exhibition will provide a unique insights into current trends and innovations in the constant evolving craft field of fiber. MGC Group Show where prints incorporate stitching, knots, needlework, threads of any kind! My works and intervew are featured in Hairblogstylist online magazine! "Hairblogstylist is the destination for all the latest gossip on hair. It includes a wide variety of interviews from the most prominent hairdressers worldwide. The main purpose of this blog is to provide feedback and support to those in need. It is not only a place for hairdressers, but also a place for anyone out there struggling with their hair." 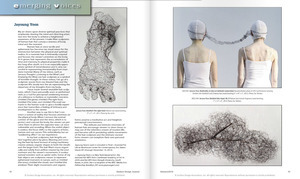 My works and intervew are featured in INFRINGE magazine! "INFRINGE is the Anthropology of Hair. we explore the world of hair creatives in the broadest sense. We cast a focus on anyone working with hair, across creative disciplines. From the hairdressers, barbers and wigmakers using it as a medium for their craft, the photographers capturing hair culture across the globe, and the artists and activists challenging perceptions of hair and its role in shaping our sense of identity." "Hand/Eye is a group exhibition of ten artists from across the United States who merge photography and craft mediums. The artworks in the show incorporate a wide array of materials—fiber, cast glass, micaceous clay, human hair—that shatter the picture plane and push photographic imagery into the real world. Features the work of Ginger Owen, Cathryn Amidei, Gary Goldberg, Elizabeth Claffey, Jodi Colella, Mira Burack, Ruben Olguin, Jayoung Yoon, Jacquelyn Royal, David Samuel Stern." October 11 - November 25, 2018.
coinciding with the acclaimed Woodstock Film Festival. "MARC STRAUS proudly presents SUTURES, a group exhibition of artworks that employ weaving, sewing, and/or fibrous elements such as thread in the composition. Featuring the work of Louise Bourgeois, Jayoung Yoon, Sonia Gomes, Brent Wadden, Lisa Hoke, Maria Nepomuceno, Michael Raedecker, Athi Ruga, Sam Gilliam, Michele Ciacciofera, Maartje Korstanje, Martha Tuttle, Elaine Reichek, Julia Von Eichel, Beryl Korot." "The 43 prints and print-based works on view in Multilayered reflect Juan Sánchez’s (Juror) interest in new narratives for an increasingly hybridized cultural world. Many of the artists skillfully deploy traditional printmaking techniques, including lithography, etching, woodcut, and screenprints, to create enigmatic characters and complex scenes, while others use prints as the basis for expansive installations." The Hudson River Valley has long been a source of inspiration to artists and a hub of creative activity. The ArtsWestchester Triennial showcases the vanguard of the region’s arts community, offering a snapshot of what’s now and what’s new in contemporary visual art. Artists working in today’s world are often crossing international borders and wrestling with ideas of cultural identity. Join Korean-American artists Tai Hwa Goh, Jiha Moon, Nara Park, and Jayoung Yoon as they engage in a lively conversation about this transnationalism and the influence of Korean tradition on their work. Sarah Newman, SAAM’s James Dicke Curator of Contemporary Art, moderates the discussion. An exhibition dedicated to artists defining the contemporary paradigm of abstraction for their own ends. Each of these twelve artists transcend the formal elements associated with non-representational art to engage with complex concepts, themes, or narratives, and prove that abstraction has the capacity to address and amplify some of the most pressing issues facing artists today: technology, identity, natural phenomena, mathematics, place, politics, materiality, and more. The group exhibition puts forward ten female artists whose artwork express deeply personal thoughts, emotional energies, and societal commentary. Through a variety of works the show examines the role and representation of women in contemporary society. Viewed as a whole, the exhibition exemplifies how various forms of art making allow for nonverbal communication on a deeply personal level, communications that are often more powerful or truthful than the verbal or the written. The works create a dialogue between the viewer and the artwork that is filtered through uniquely female experiences and perspectives, inviting viewers to question modern social and political landscapes. The Hudson Valley Center for Contemporary Art (HVCCA) in Peekskill NY welcomes work from a leader in the current fiber arts movement, artist Orly Cogan, for her solo exhibition Summer Lovin’. The exhibit will run from June 10th to July 31 an opening reception at the museum on Sunday, June 10th from 5:30 -7 p.m. preceded by the artist panel, “Home: A State of Mind,” featuring Orly Cogan, Susan Obrant, Jayoung Yoon, and Erika Harrsch with a special reading by Sharon Samuel and Celia Reissig-vasile. interconnections between the personal, cultural, religious and national. The works reflect the human need to tell the story of self and society, offering a rich conversation about the sameness and differentness among us. There is an emphasis on the inclusion of senior artists whose works cogently reflect lives lived across significant changes in history. EVIDENCE is a living / breathing / micropublishing project currently based in Montréal, Québec. EVIDENCE began in 2017 as an annual collection of highly curated multimedia printed works +has since expanded to collaborate with artists, academics + beyond in the production of fine handmade limited edition chapbooks, anthologies, + artist books. I am honored to be an award winner in the Textiles in Performance category! The artists in Land and Time confront monumental transformations through video, sculpture, performance, and painting, embracing time as a palpable element in their work. These artists mine forgotten histories or expose imagined landscapes, reminding us that every “landscape is not a record but a recording,” polyvalent and multivocal. Land and time are in flux, unable to be pinned down, frozen, or commodified. And yet, they reflect upon us. Bronx Calling: The Fourth AIM Biennial features the work of seventy-two emerging artists from the 2016 and 2017 classes of the Bronx Museum’s Artist in the Marketplace (AIM) program. AIM provides professional development resources to emerging artists living and working in the New York metropolitan area. The exhibition is organized by Aylet Ojeda Jequin, Associate Curator of Contemporary Art, National Museum of Fine Arts, Havana; and the Bronx Museum’s Christine Licata, Director of Community and Public Programs; and, Heather Reyes, independent curator. Soft Power is a group exhibition which explores notions of human condition and power dynamics through the use of hand manipulation of “soft” malleable materials such as felt, fabric, canvas and human hair. The artworks include sculptural objects, wall hangings, canvas constructions and performance. United by their use of soft materials and the handmade, each artist uniquely activates their own space of inquiry, evoking their own relationship to place, body, space and time. *My work is in Colonels Row Bldg 404A, Second floor. The Korean Cultural Center Washington, D.C. proudly presents Evolving, a new exhibition in which five American artists from The Drawing Room collective use a variety of creative media to reflect on their early youth in Korea, through the evolving lens of their present lives settled in the United States. Through fabric, sculpture, collage, and visual art, blending Korean and Western materials, Evolving exudes the liveliness of these artists’ childhood memories as well as their individual struggles and progress since, evolving from immigrant to American in different environments. My works are featured in Make8elieve online magazine, Issue #11. Make8elieve is usually an online magazine, born of a collaboration between two artists, Michelle Marie Murphy (Chicago, Illinois) and Baptiste Lefebvre (Cetusss) (Geneva, Switzerland). With Make8elieve, we’d like to build international connections by publishing creative interpretations of one topic per issue. We believe we can organize an intelligent, challenging, and well designed magazine with contemporary and unusual topics. Opening reception on Saturday, June 3, in conjunction with the 2017 Newburgh Illuminated Festival from 11 a.m. – 5 p.m. This event is free and open to the public. ICEVIEW Volume 1 is a bilingual collection of fiction, nonfiction, poetry, and visual art inspired by Iceland. The works in this volume explore the impact that geology and environment have on identity, investigate questions of displacement, community, (un)belonging, and the ethics of contemporary travel. Gallery open for public viewing, 1:00 to 5:00 p.m. on ​Mondays, Fridays, Saturdays and Sundays (except Saturday March 18, Sunday March 19, and Sunday, March 26, when the hall will be used for paid-admission events.) Saturdays March 25 and April 2, 1:00 to 2:30 p.m.
Gallery 224 presents Leslie Pontz, Warren Seelig, and Jayoung Yoon in a group exhibition curated by Craft + Material Studies Program Director Mi-Kyoung Lee. I am happy to announce that my work is included in the book, "See Yourself X: Human Futures Expanded" by Madeline Schwartzman, published by Black Dog Publishing. My presentation from *PechaKucha Beacon Vol. 7 is live on the Official Pechakucha Website. It was wonderful to meet the junior and senior students in the Fiber Program at Uarts, as a visiting critic, and to give my artist lecture! “Eighteen” exhibits the work of Dev Harlan , Cheryl Wing-Zi Wong and Jayoung Yoon — three artists working in sculpture, installation and transformation over time. The title of the show references the spatial concept of Gallery Usagi; architect Sou Fujimoto’s design is based on eighteen movable panels that divide, striate and give impermeability to our space. In “18”, the panels are used not as surfaces to display 2D work, but as interventions in space that divide time. "PechaKucha 20x20 is a simple presentation format where you show 20 images, each for 20 seconds. The images advance automatically and you talk along to the images." Keith Schweitzer of ART(inter) in conversation with New York-based artist Jayoung Yoon. An online archive of videos by Skowhegan alumni. "Jayoung Yoon's sculptures from her "Form and Emptiness" series consist of meticulous woven mesh boxes, hung from the ceiling. Each cradles a different geometric form at its heart, and all are woven from strands of human hair. The resulting little abstract sculptures feel both intimate and elegant." I am participating the first ‪Portal‬ ‪Art Fair‬ organized by ‪4heads‬ at ‪Federal Hall National Memorial‬ in ‪New York‬ during ‪‎Frieze week. The fair features 28 artists. Featured artists will install their work across three floors of the building. My work will be at the lower level rotunda. "Wearle Matters took place for one evening on May 2nd, 2015 and featured work by local and international artists". "The Wearble Matters event arose out of our shared interest in artork that attempts to directly reach the viewer as a wearer; to implicate their bodies." *Please note that there is FREE ADMISSION ON FRIDAY EVENING. Intricate Realities, a group show featuring the work of Patrick Duffy, Hannah Brenner-Leonard, and Jayoung Yoon. Flowing repetition of form and precise attention to detail form a unifying link between these three artists. Opening reception on Saturday, March 5, 3:00 - 5:00 PM. I am so happy to announce I have been accepted the Artist in the Marketplace program in 2016 at Bronx Museum. The AIM program provides professional-development guidance to emerging artists. Every two years, the museum organizes the biennial. My Space is located in the 190 N Water Street, Peekskill, NY. It is a site-specific installation project, ‘Web of life’, an 8-foot diameter sculpture composed entirely of hand-knotted human hair. There will be a live performance with my hair installation, Noon to 2:30pm. I am participated in 8th Annual Governors Island Art Fair in September! My room is located in Building 408B, 1st Floor. Governors Island Art Fair is organized by 4heads, a New York City nonprofit organization, created by artists for artists. Locations: Governors Island, Colonels Row Bldg. 404, 405, 407 and 408. Hours: 11am – 6pm on Saturdays and Sundays, September 5 – 27, 2015.
plus an extended time on “Second Saturday, Beacon", May 16th opens until 9:00 P.M.
is a presentation and exploration on wearable art made by local and international artists. We invite the public to not only observe but participate in the artwork embodiment. Gallery hours are Friday - Sunday 12 - 5 pm and by appointment. Eternity isn’t some later time. Eternity isn’t a long time. Eternity has nothing to do with time. Eternity is that dimension of here and now which thinking and time cuts out. This is it. And if you don’t get it here, you won’t get it anywhere. My work has been selected for Professional Press Release. March 23 -April 9, 2015. This group exhibition “Repsychling” presents the works of professional, self-taught, and student artists who investigate processes which explore art making through recycling, repurposing and repetition. The group exhibition introduces art that explores how artists’ conceptualizes what they see through materiality, multiplicity and replication. The diversity of participating artists in “Repsychling” offers new perspectives and raises inquiry of the traditional paradigms of art in society and art education through materials and reiterations of content. 2015 Kreft Juried National Exhibition examines and illustrates the relationship between these two entities. Coupling them immediately suggests pairs of opposites: physical and metaphysical, flesh and spirit, earth and heaven. How do we live in the body and yet recognize and celebrate the soul? How is one manifested through the other? What do they tell us about the nature of human personhood? What might it mean to be “soulful”? A article on my work written by Angeli Sion. BRIC has programmed ‘2014 Media Arts Fellowship Screening’ to air on their channels over the next couple of months. Also you can watch only my interview on BRIC’s Youtube. Come see what the 2014 Media Arts Fellows have been up to! Attend a screening of work created by this year's Fellows, using the skills and knowledge they have acquired during their BRIC Media Arts Fellowship, which makes BRIC's Media Education courses, equipment and facilities available to professional Brooklyn-affiliated visual artists at no charge. de novo dance(www.denovodance.com) presents Sleep Lab, two different evenings of works-in-progress made by company members, guest artist friends, and artists from the HANAC Harmony Innovative Senior Center in Astoria. A collaborative event at the KuBe combining works from over 30 artists, Principals Principles explores formal and conceptual connections between a diverse range of artists' principles, and the principal languages invented by each.Please join us this coming second Saturday for several solo exhibitions, musical performance and a large scale group exhibition of local and international artists in the Kube's Art Center. Exhibitions and events will start at 5 PM, with an after party and music in the courtyard from 7-late. I am participated in Anne Wilson's group performance, 'To Cross (Walking New York)' in conjunction with the exhibition Thread Lines at The Drawing Center, NY. I will perform these sundays. In conjunction with the current exhibition, Subtle Approach, BAC Gallery presents a screening of Cleansing the Memories and Quiet Mind, two videos by Jayoung Yoon. In this site-specific performance, we inhabit the Urban Garden space for 6 days between hours 8PM and 12AM. “Time-space capsule”invites the artists and the audience to enter a suspended time-space in the midst of ever accelerating New York City in search for glimpses of stillness, simplicity, nature, and beauty. We use movement, non-movement, visibility and invisibility, vulnerability, and public engagement as vehicles for transformation. de novo dance is partnered with HANAC (www.hanac.org), one of New York City’s largest and most successful social service organizations. We are proud to collaborate with seniors from the HANAC Harmony Innovative Senior Center in Astoria, Queens. BRIC is pleased to announce the 13 artists who have been selected to receive the 2014 Media Arts Fellowship, an award which makes BRIC’s state-of-the-art media facilities and training programs available to professional Brooklyn-affiliated visual artists who have an interest in taking their practice farther. 2014 Media Arts Fellows: Santina Amato, Reginald Ellis Crump (AKA Monstah Black), collaborative team Terri Chiao & Adam Frezza, Mike Estabrook, Buhm Hong, Hayat Hyatt,Jenn Kahn, Bundith Phunsombatlert, Elizabeth Riley, Ryan Hartley Smith, Laura Silver, and Jayoung Yoon. An exhibition-in-print that explores the mercurial, intangible, messy, and expansive subject of love. We are artists who live and work in Los Angeles, and we are working to publish a limited edition art book called Articulate. For this edition, all the work explores the topic of love. Articulate is an exhibition-in-print that gives you the opportunity to bring home a thoughtfully curated selection of art and allows artists to get their work out to viewers without relying on galleries. STONE VOICES explores the many connections between art and spirituality. Its premise is that art has the capacity to touch the human spirit, awaken conditions for genuine healing, and enrich people’s lives with tremendous joy. Monday-Friday 12 - 5 p.m. Periodically, BRIC invites well-known artists and arts professionals to create a Short List of some of their favorite artists in the BRIC Contemporary Artist Registry. The artists on the Short List arefeatured in the main slideshow on the Registry homepage.